There are several real challenges for machine embroidery digitisers but one of particular frustration is choosing the shades of embroidery thread and how they are best portrayed! I am constantly aware that the shades and tones used in my designs are a very important part of their quality and finished appearance. The combination of colours used for a design collection can be the difference between being irresistible or being dismissed as like many others on the market. Selecting the correct scheme of colours is as crucial as the actual digitising but there is a problem. I do my work on a laptop when I am being sociable and on a PC when I shut myself away in my studio. It is amazing how different the colours of my designs look on these two devices. A computer displays colours differently depending on the screen and the browsers settings! However that is only part of the problem as my embroidery software does not display the colours of my embroidery threads realistically either. As I experiment with various threads in the colour panel I am aware that the lovely colour I have just chosen for my leaves may look good on the screen, but that it will actually be very different in real life. Those of you who have been fans of my designs will know that I have my favourite shades within the huge spectrum that Sulky Rayon offers, but when I select 1209 for example for leaf work, the colour is not at all accurate on the screen! Take my recent Floribunda’s Serenade photographed here. My digitising process begins in my Wilcom Embroidery Studio, a commercial software that is outstanding. Colours in that software may look great but when I open the design in Husqvarna 6D premier software to complete the process, the difference can be quite dramatic. It is only when I begin testing my designs on my Husqvarna Diamond deluxe machine I start to finalise the best combination of colours. Preparing images of the designs that are near completion can be quite a challenge as the resulting picture for putting up on my website often looks very different from how the design has stitched out for me in my chosen colours. 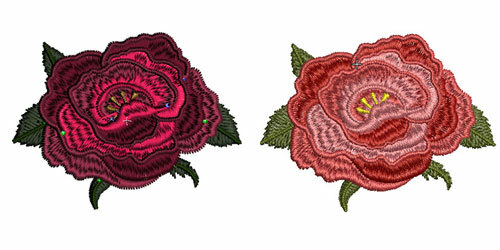 These 2 roses are exactly the same, but one is taken from my Wilcom software and the other from my Husqvarna software. You can see how very different the colours are portrayed from the actual stitch out above. With the launch of my new website on Friday this week (hopefully!) you will notice many changes in the way that my sets and collections are presented. The most important feature is that the images will be much bigger, displaying at 500 pixels square for those who know what a pixel is! (I think it is a tiny dot on your screen, and obviously there are thousands on any screen.) You will be able to scroll through all the designs in a set seeing them in much more detail, especially the smaller ones for 4″ x 4″ hoops. Unfortunately as the designs in each set get larger their images become smaller! You need to be aware that the combination of colours that you see are not an exact representation of the colours I have used in my stitch outs. 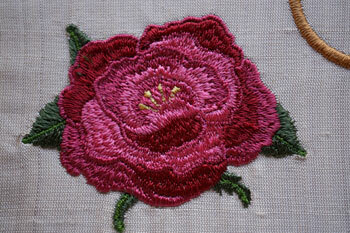 After much deliberation I have chosen to portray each design as an image which has been taken off my embroidery software. There will be photographs of stitch outs available in the forth coming galleries on the website and also in the categories for the collections. Searching through each collection you will see a photograph of a stitch out from the collection where I have tried to capture its beauty and show you the intricate details of the embroidery. However even a photograph cannot be an exact representation of the colours as I discussed earlier. As viewing colours is so haphazard in the digital world I want to encourage you to know your own threads and which ones work together well. Your preference may not be Sulky Rayon but one of the other excellent manufacturers available. There are charts available on the Internet that will help you to convert Sulky threads to your thread manufacturer. I encourage you to get to know your threads and take them outside so you can see them in natural light. You will be surprised at how different they appear and how much easier it is to make a good selection of shades that work together well. While you are out there take them to some leaves or flowers and try to match them. I love green and have to admit it is my favourite colour providing it has a yellow hue to it and not a blue one, but I think I have more greens than any other colour but there never seems to be enough to choose from. Many a time I look through all my shades of green and cannot find the perfect match. I have to admit that I prefer to use only one manufacturer but that is only my personal preference. I use Sulky Gutermann threads because they are excellent quality and I can secure the thread end to prevent them unravelling. They sit nicely on the spool of my machine and are not too bulky and are supplied by my main embroidery machine dealer here in the UK. This range of threads is available in the UK but I think I am right in saying that it does not cover the full range available in the USA, so occasionally I need to top up from Sulky America. When you go on your next trip to the shops look at the colours that have been used in clothes and linens etc. I admit that sometimes the colour combinations that really impress me are captured on my iPhone to consider for an embroidery project. Just because I have chosen specific colours for an embroidery collection doesn’t mean you have to stick with them. Experiment with colour and remember that it is only when you make that choice of threads and line them up for your embroidery project that the final look of the embroidery is decided. I advise that you open the design in your embroidery software and make the necessary thread conversions, and you will see how different they look on the screen! Then you will know what I am talking about. If you do make these adjustments and save the file give it a new name so the original embroidery file is kept for safe keeping. p.s. 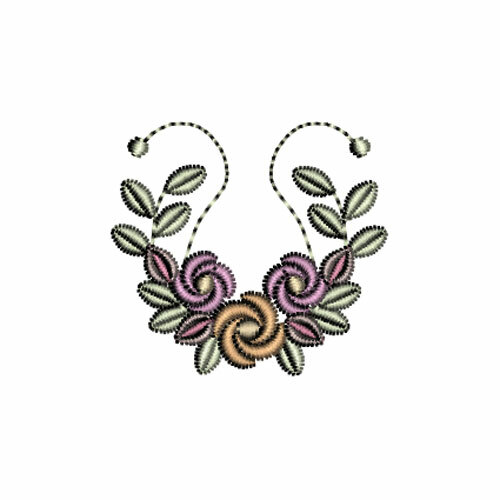 There will be no change in the URL address of Graceful Embroidery when the New website is launched! 4 Responses to The Problem of colour! Have you looked into color calibration software for your screen? It ay help some of your problems of color choices. Hi Hazel! Like you, I have my favorite colors and they do not appear the same in 6D as in real life, but natural light is the very best for picking your colors! Thanks for all your efforts in creating gorgeous designs that stitch beautifully!